Media stories covering Therion's Fish Species Substitution work are available here. Are you confident that the fish you are buying, selling or perhaps eating at your favorite restaurant is the species that you think it is? Species Substitution is one of the more common forms of fraud in the seafood industry. Because (1) the meat of many species of fish share the same taste or texture and (2) it is difficult to perform visual species identification on fillets, it therefore becomes easy to substitute an inexpensive species for a pricey one. Therion offers a variety of DNA-based assays to differentiate among various fish species. Using the techniques of DNA sequencing or DNA amplification we have been able to address questions concerning substitutions for red snapper, grouper, tilapia and walleye. In addition, the scientists of Therion can develop novel assays to work with any other species of interest. Red Snapper or ??? Grouper or??? 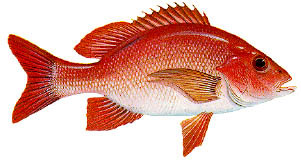 In a survey of “red snapper” served in 39 restaurants across six cities in the Southeastern US it was determined that 19 out of the 39 samples tested were indeed not red snapper, but a cheaper species substitution. The substituted species included lane snapper, scarlet snapper and even tilapia and horse mackerel! 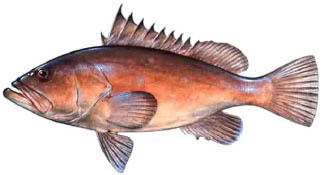 Similarly, in a survey of numerous lots of “grouper” fillets about to be purchased by an importer/distributor it was determined that only a small proportion of fillets were actually from grouper species. Among the species commonly substituted were emperor fish, lesser snapper species and even sculpins! Pictured below are mitochondrial DNA sequences from authentic red snapper and grouper individuals, respectively. Walleye is a popular tasty freshwater fish endemic to lakes in the Northern US and Canada. In a study of fish served in 30 restaurants across four cities in the Great Lakes region of the US it was determined that 12 of the 30 cooked fillets tested were actually from zander. The zander is European species from the same genus as the walleye, which is farmed, exported to the US and can be purchased for as much as $2 less per pound than the locally caught walleye. 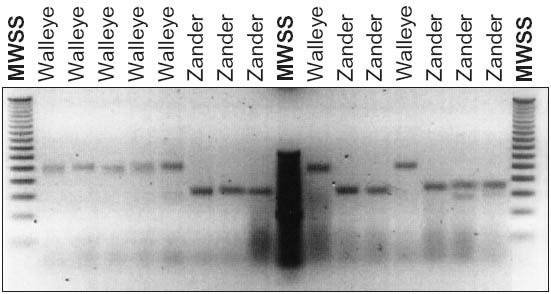 Depicted below are results from a DNA amplification assay showing the difference in allelic sizes between walleye and zander. In total the assay developed by Therion for these species surveys six independant species- specific microsatellite loci. Download the Adobe Acrobat version of this page (aquacult-ss.pdf). Last updated: March 15, 2007. Contact Therion's if you have problems viewing this site.